The Signal Transduction Society (STS) - established in 1998 - is a non-profit organization, which provides an interdisciplinary forum for scientists with a common interest in signal transduction processes in cells and organism. The STS is tightly associated with the DGfI, the DGZ, the GBM and the DGP and closely cooperates with national and international research consortia. 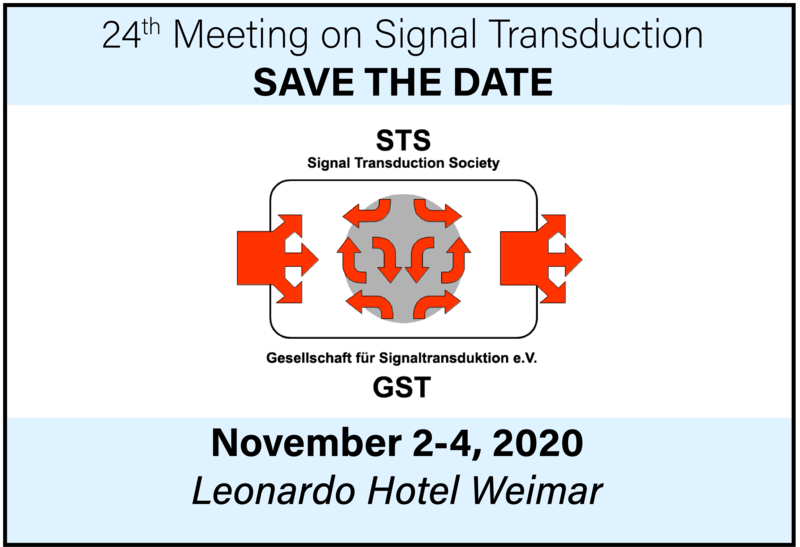 The STS annually organizes the Meeting on Signal Transduction with a special focus theme each year. In 2019, the special focus of the meeting is on «Trends in Cancer and Infection». On November 4-6, 2019 (Mon-Wed) the 23rd Meeting on Signal Transduction with special focus on «Trends in Cancer and Infection» will be held at the Leonardo Hotel in Weimar. The annual membership fee is currently set at EUR 45 for full academic members, EUR 25 for students / doctoral candidates, and EUR 125 for company memberships. Our online membership application process was updated to use the SEPA direct debit service. © 1999-2019, Gesellschaft für Signaltransduktion e.V.